Is Samuel Etoo Gay ? Samuel Eto'o Fils is a professional Cameroonian football player who plays for Sampdoria club and the Cameroon national football team as a striker. He is known for his stamina and is a stunning goalscorer with good technique. He attended the Kadji Sports Academy. He is awarded the African Player of the Year award for four times: in 2003, 2004, 2005, and 2010 and was third in the FIFA World Player of the Year award in 2005. 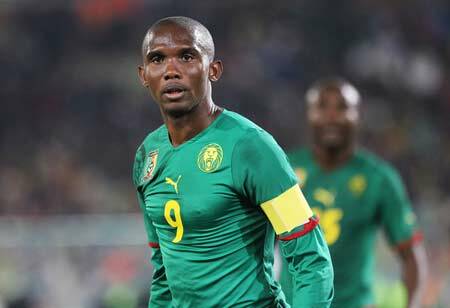 Samuel Eto'o was born Samuel Eto'o Fils on March 10, 1981, in Douala, Cameroon to father, David Eto'o and Christine Eto'o. From the early age, he was interested in the game of football, and by age 11 he joined Kadji Sports Academy playing in the youth squad. He was part of the club for four years after which he joined Real Madrid also playing the youth squad. At the time Real Madrid was relegated to Segunda Division B, and in that league, non-EU were not allowed to play due to which he played for Leganes, second division club, on loan. In the winter transfer window, he was loaned out to Mallorca. For the club, he scored six goals in 19 appearances. At the end of 1999-2000 season, he became a permanent player of Mallorca for the club's record transfer fee of £4.4 million. His second season with Mallorca ended with him scoring 11 goals. His skill and style of play helped him gain fame and attention of the fans. He enjoyed his spell with Mallorca and according to the fans appreciated him and also was well looked after in the club. He showed his gratitude to the fans by donating €30,000 to provide meals to the traveling Mallorca fans during the Copa del Rey finals in 2003. In the final match against Recreativo de Huelva, he scored to goals in their 3-0 win. In 2004, he signed a contract with Barcelona, departing Mallorca as the all-time highest scorer in the domestic league with 54 goals. That season Barcelona won the La Liga. As a victory celebration, a festive party was organized in the Camp Nou during which Eto'o ranted at fans chanting 'Madrid, cabron, salude al campeon' (Madrid, bastards, salute the champions) for which the Royal Spanish Football Federation fined him €12,000. Eto'o reached the highest point of success during his run with Barcelona. He scored six goals in Barca's 2005-06 Champion's League campaign including the winning goal in the finals against Arsenal. His crucial role for Barcelona won his UEFA Best Forward of the Year. That year he won African Player of the Year for the third consecutive time and finisher third for the FIFA World Player of the Year making him the second African footballer to be voted in the top three. On February 24, 2008, he scored his first league hat-trick against Inter Milan. On November 29, 2008, he made it in the club's top goal scorers after netting his 111th goal against Sevilla. He scored the 99th and 100th league goal against Real Betis on November 29, 2008. 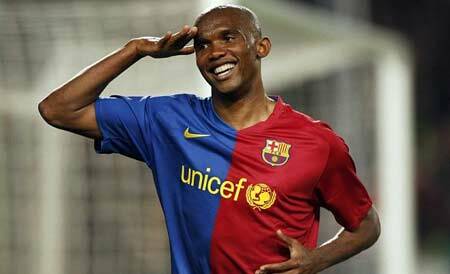 Eto'o also won the 2009 UEFA Champions League with Barcelona, scoring the opening goal in the finals against Manchester United. On July 27, 2009, Eto'o signed a five-year contract with Inter Milan. He scored the first goal for the club against Lazio on August 8, 2009, which ended with Barcelona losing 1-2. His first hat-trick for the club came against Palermo in their 5-3 win. He played a total of 67 games for Inter with the impressive figure of 33 goals. From 2011-2013, he played for Russian club Anzhi Makhachkala. In his 53 appearances for the club, he netted 25 goals. He then played for English Premier League club Chelsea for the 2013-14 season. His first goal for the club came against Cardiff City on October 19, 2013. He scored his first hat-trick on January 20, 2014, at the Stamford Bridge against Manchester United which the Blues won 3-1. The next season he joined Everton and during his season-long run with the club, he appeared in a total of 14 games scoring only 3 goals. After the end of his contract with Everton, he played for Sampdoria and Antalyaspor. As of 2018, he plays for Konyaspor signing a two and a half year contract on January 31, 2018. Eto'o debuted for his country, Cameroon just before his 16th birthday on March 9, 1997, against Costa Rica. At the age of 17, he made World Cup debut in 1998 making him the youngest player in that World Cup. His first World Cup goal in 2002 against Saudi Arabia. Altogether, he has won Africa Cup of Nations twice(2000 and 2002) and 2000 Summer Olympics for Cameroon. He has earned altogether 118 caps for his country netting 56 goals. The former striker of Cameroon has accumulated a hefty net worth which is estimated to be around $75 million as of 2018. In 2013, he earned €8 million($9278592) as salary. He also earned a good sum from his endorsement with Puma estimated in millions. His current market value is €900k and it was the highest on July 10, 2008, at €37.80 million. He has a collection of luxury cars including a Rolls Royce Wraith, Maybach 57 Xenatec, Ferrari 599 GTB, Bugatti Veyron, Aston Martin One 77, Ferrari 458, Audi Q7, Lamborgini Murcielago, Hummer H2, and Mercedez SL65 AMG. He also owns a private jet. In 2015, he bought a mansion in Portofino, near Genoa in northern Italy for €18.5 million($21456744). Even though the locals warned about the house being haunted, he bought it. 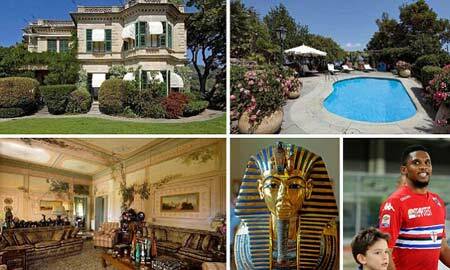 The mansion covers an area of 30,000 square meters and consists of 40 rooms. He is a married man. He married his longtime girlfriend who is a mother of his two kids. It has been reported that he proposed to her with a 500,000 Euro diamond ring. They married traditionally in 2007 and renewed their vows on 14 June 2016 in a lavish white ceremony and gave a big reception wedding party. He arrived in a vintage car wearing a grey suit. The ceremony took place at Stezzano, Italy where hundreds gathered to see the bride and the groom. One of the guests included Carlos Puyal and his wife. The pair has two children Siena and Lynn. Eto'o also has two children Maelle and Étienne from his previous relationship. The family of six live in Paris. "I met my wife when I was still an amateur footballer in France. FC Nantes refused to take me but my wife always believed in me. I had my little Camer accent car and she was responsible for it. She owned a Barbering Saloon in Nantes. Today she is the wife of the Richest football player on the African continent and I’m married to the most patient woman in the world. Enough!" She is an Ivorian beauty and his long time girlfriend with whom he has been with for more than ten years. He is the only son to his parents. He is quite grown up and interested in football. She is a beautiful and adorable daughter of her romantic parents. There is no information about her birth date. She was born healthy. She is happy with her parents. There is no information about her birthday. She is very adorable. She is very young. She is a very happy child. She is often seen playing with her siblings.